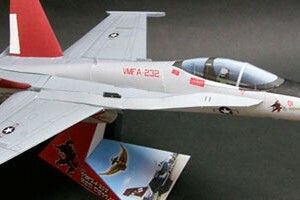 Do you remember Kim, he is from South Korea who frequently recolor Paper Replika F-18 Hornet and F-15 Eagle? He is now designing his own paper model. This is his first try under DAEHO publishing (DH) - Hardcraft, and I must say his work very good quality for the first timer. 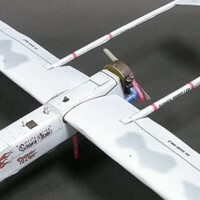 He created a pattern of a US Army RQ-7 Shadow in 1:12 scale, it is a unmanned aerial vehicle (UAV) for aerial surveillance and other purposes related to it. The patterns are very detail and by looking at this template with all formers and without the use of flaps (glue tap), I can say this model is not for beginner. The model is very beautiful and detail, but this is for advance paper modeler and I know this type of patterns is very familiar and preferably by aircraft paper modeler. He shares the patterns to all of us for free. I leave the file as the original file which Kim sent to me, plus I split it into 4 small parts just in case you have trouble downloading the full size (11 MB). The pattern is in PDF with no password. Assembly instruction is included in that file. Actually I have received this model pattern since two weeks ago, but I just got time to edit it and upload just now. This model was submitted by Kim. 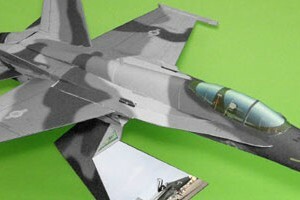 As previous of his works, Kim recolor the original Paper Replika F-18 template with new livery. This time he make an F/A-18A from VMFA-232 Squadron. VMFA-232 is a code for US Marine Corps Squadron based in Air Station Miramar, California or The Red Devils. This Squadron is the oldest among other Marine Corps Squadrons, commissioned in 1925 with Vought VE-7 as their first aircraft. This squadron also involved on Operation Iraqi Freedom (2003) the last one on Operation Enduring Freedom (2005-2010) in Afghanistan. This model was submitted by Dani Hamdani, he recolored Paper Replika C-130HC with US Coast Guard livery into C-130H-30 TNI AU livery. The real Hercules is operated by 17th Squadron VVIP based on Halim Perdana Kusuma AFB. I also found a video on Youtube that shows Hercules that using this livery color, go to 2:41 it is the ninth plane that take off that day. Both paper model photos below were assembled by Dani. 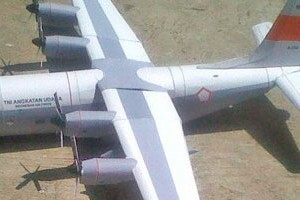 This model is the result of recoloring aircraft model that is already on paper replika, a Piaggio P-180 Avanti. This is my first time recoloring this type of aircraft. 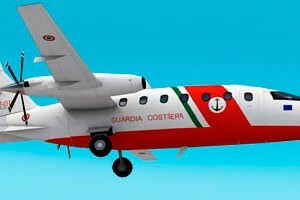 I'm coloring its livery using Italian coast guard color (guardia costiera). Not too much difference compared to the previous model, there is only little different detail. This type of aircraft is the only one owned by the Italian coast guard. Basic pattern is still the same as the previous model, which is 3 pages. This hornet is one of Naval Strike and Air Warfare Center (NSAWC) aircraft trainers, they role as aggressors, enemy aircrafts. NSAWC is a main Naval training center and air tactics development located in Fallon, western Nevada USA. This hornet uses gray splinter camo. The templates is modified from Paper Replika's F-18 Blue Angels by our friend Kim.